Suri wore this Quilted Jacket in Black from SS 09 Collection by Il Gufo, while hanging out on set of the DBAOF in Melbourne on August 22nd. Suri wore this gorgeous Pattern Dress with Bow in Gris from Fall 08 Collection by Il Gufo, while out & about in New York on September 27th 2008. 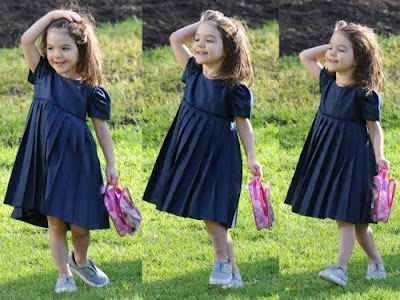 Suri Cruise has proved she is not just the best-dressed tot around the globe, she is also the most worldly and well-mannered. Katie Holmes and her three-year-old daughter were eating out at Wagamama restaurant in Flinders Lane on Friday. As staff were clearing their plates, a laid-back Holmes mentioned Suri loved eating edamame beans. 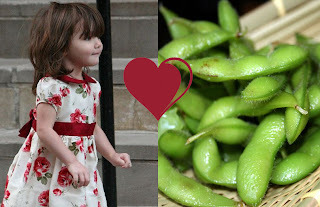 The boiled and salted soybeans would not be the first choice of food for most three-year-olds. But Suri confirmed her love of the soy bean pod by pleading with her mum to have some more. "Mummy, I want more edamame," Suri said to a stunned floor staff member. "Most people don't even know what edamame is," a member of the Wagamama staff said. As the famous mum and daughter left, staff were further enamoured to find a big thank-you note written by Suri, no doubt with the help of Holmes, on the back of a comment card. Suri wore these Jersey Harem Pants in Jewel Marle by Seed, while relaxing in Melbourne's park on August 15th. 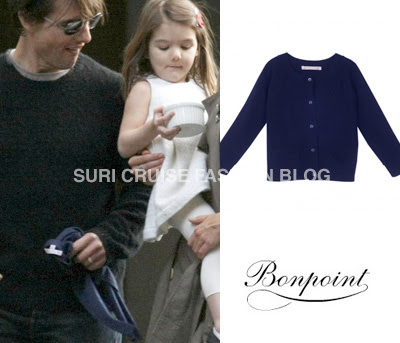 Suri wore this Beaded Neck Detail Tee in Charcoal Marle and it is also from Seed. Suri wore these Side Flower Ballet Shoes in Fuchsia, while out & about on the set of Don't Be Afraid of the Dark on August 14th. 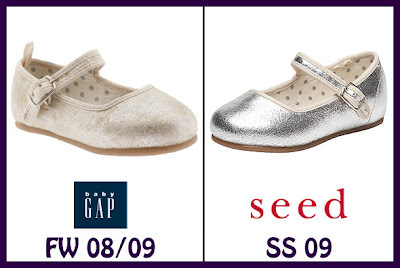 and about this brand - SEED, my personal opinion - i dont like it, cause i hate knock-offs..
and its not all, they also copied Silver Mary-Jane Shoes from Gap's Northern Lights Collection (also Fall'08)... these are way toooo similar to be a coincidence, imho. Cuise family enjoyed another idyllic day out as they relaxed by the lake near Government House in Melbourne's Royal Botanical Gardens on Saturday, 15. Suri & Katie are spending their last day with Tom before he hops back on a plane and heads home. Suri is wearing her favorite Grey Canvas Sandshoe by Walnut, which she got as a present together with ballet flats & other shoes from Walnut (Australian brand). 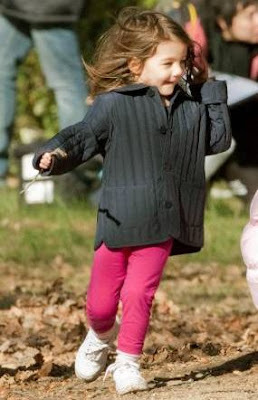 Suri & Tom were spotted spending on the set of Katie’s new film on Friday, 14. 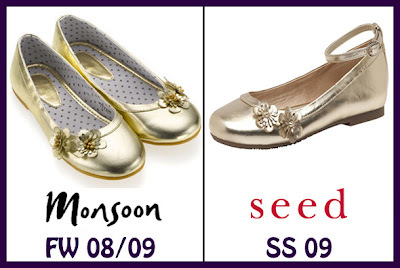 Suri is wearing Metallic Pink Flower Flats by Monsoon. Suri is keeping warm in Cotton Spandex Jersey Legging in Ultramarine + Black Polka Dot and Polka Dot Fleece Zip Hoody in White by American Apparel. 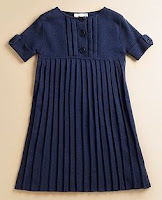 Suri is wearing Silk Ruffle Dress by Tiddles & Chinch - Australian Brand. 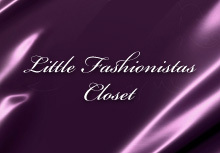 Suri's dress is from their upcoming Summer Collection and is not yet available on-line. Thanks to Mandee for finding this dress! 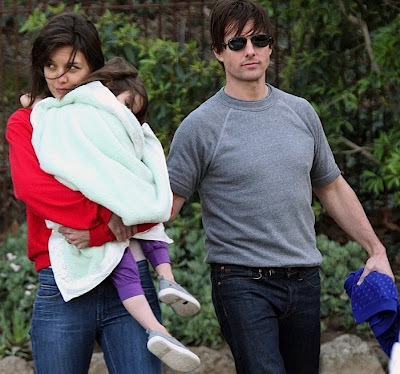 Suri enjoyed some lunch on the run while on an outing in Melbourne, Australia, with parents Katie Holmes and Tom Cruise on Wednesday, 11. 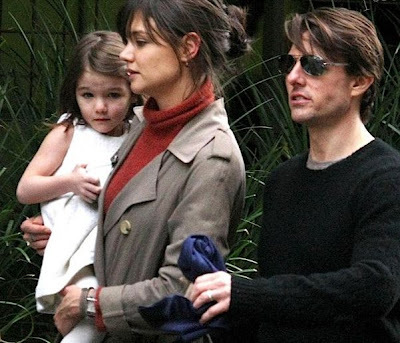 Suri has been on the film set with her mother for some weeks now, but the family were reunited on the weekend when Tom flew in to join them. Suri is wearing Spanish Stripe Shoe by Chook Leaf - Australian Brand. Suri is wearing White Wool Glimmer Dress by Juicy Couture. After their busy morning on the set, S&K had some family fun with Tom at the park in Melbourne on Friday, 7.
i guess, that this dress is designed by Holmes & Yang..
Suri & Katie were spotted on the set of her latest film Don’t Be Afraid of the Dark on Friday, 7. And it looked to be a busy day for Holmes, as she was spotted wearing three different outfits as she filmed a variety of scenes for the new suspense flick. 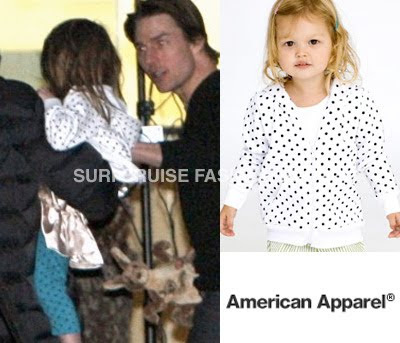 Suri is wearing Polka Dot Fleece Zip Hoody in Black(available in-store) by American Apparel. Suri is sporting Fine Jersey Short Sleeve T in Grass and Cotton Spandex Jersey Wide Waistband Skirt in Mint, both by American Apparel. and she is wearing Grey Canvas Sandshoe by Walnut. 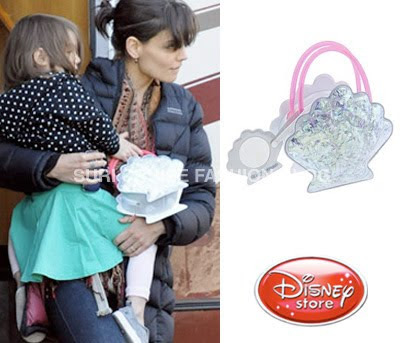 Suri accessoried her outfit with Shell Purse with Compact from The Little Mermaid Broadway Musical range. 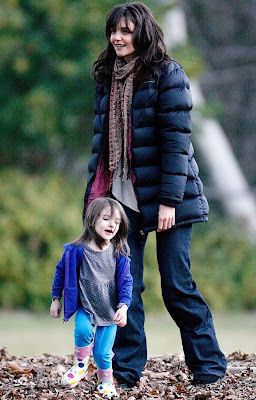 Suri & Katie take a walk during a break from filming of her new movie Don’t Be Afraid Of The Dark on Thursday,30 in Melbourne, Australia. Suri is wearing Silver Ballerinas by Bikkembergs. Suri & Katie run around the front of an old convent on the set of Don’t Be Afraid of the Dark in Mount Macedon on Tuesday, 28. 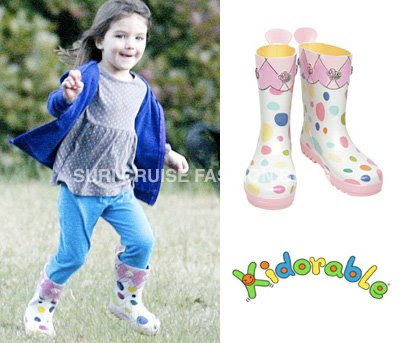 Suri is wearing English Rose Dots Rainboots by Kidorable and Teal Footless Tights by Moppit. 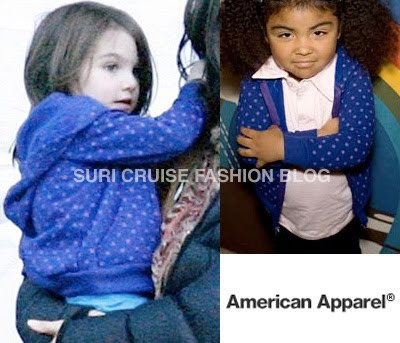 Suri keeps warm in her Polka Dot Fleece Zip Hoody in Blue(available in-store) by American Apparel. 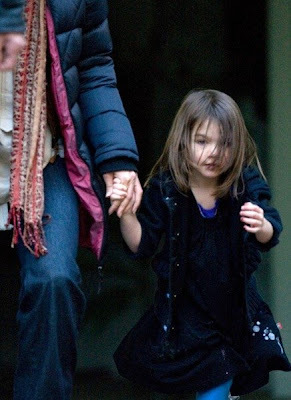 Suri visiting her mother - Katie, on the set of ‘Don’t Be Afraid Of The Dark’ in Australia on Monday, 27. Suri is wearing Charity Black Dress & Teal Footless Tights, both by Australian childresnwear brand - Moppit. 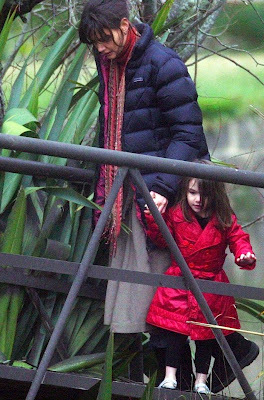 i still need to id this black jacket..
Suri Cruise enjoyed a trek through the Australian bush with her mother Katie Holmes on Wednesday, 22. The twosome took their walk on a break from filming Katie's new movie on location and were joined by Katie's young Don't Be Afraid of The Dark cast member Bailee Madison. Suri is wearing Air Force 1 Low Kids Sneakers in White by Nike. 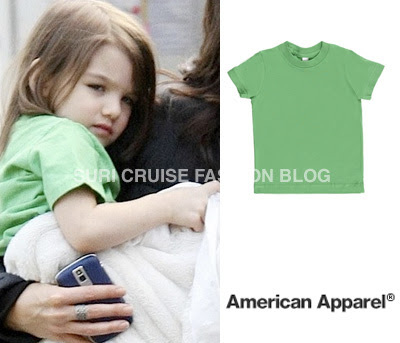 Suri is wearing Thermal Long Sleeve T in Asphalt and Cotton Spandex Jersey Legging in Raspberry from American Apparel. Suri Cruise chews on her blanket while being carried on a movie set by mom Katie during a break of filming Don't Be Afraid of The Dark at Mount Macedon country in Victoria, Australia on Tuesday, July 21. 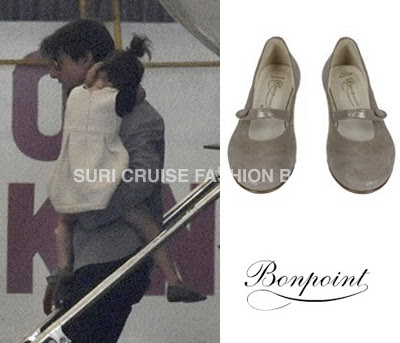 Suri is wearing Suede Ballerinas in Gris by Bonpoint, which she first wore while arriving to Melbourne on July 1st 2009. 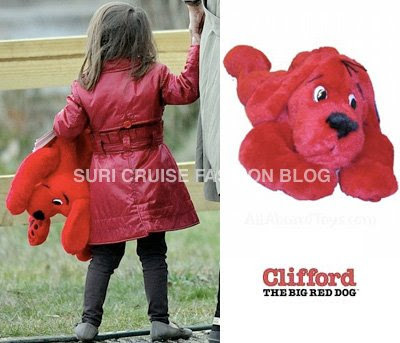 Suri carried around a stuffed animal of Clifford the Big Red Dog. Suri & Katie stepped out for a coffee break at Laurent Patisserie in Albert Park last night. To the shock of fellow patrons, the famous pair relaxed over hot drinks and "macaroon" cakes at upmarket bakery Laurent. Wearing Dorothy the Dinosaur boots, three-year-old Suri downed a "babychino" while she giggled with her A-list mother under the watchful eye of their nearby minder. But the toddler wasn't impressed when starstruck customers sat at their table, just seconds after the duo stood to leave. "Mummy, they are in my seat," Suri said. "That's all right, darling they probably thought we had finished," Holmes replied. Suri together with her parents watch the the stage production of Jersey Boys: The Story Of Frankie Valli & The Four Seasons at Princess Theatre on Sunday, 5. The Australian production of the Tony Award-winning musical officially opened the day before (July 4). 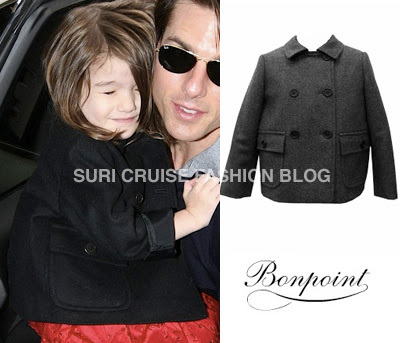 Suri is wearing Wool Double-Breasted Jacket in Black from FW 08/09 Collection by Bonpoint. ..and a backstage photo (from Australian edition of OK! 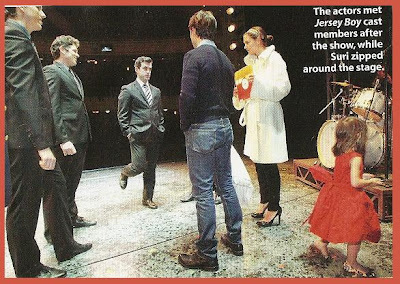 Magazine) of Suri zipping around the stage while her parents are meeting with Jersey Boys cast.